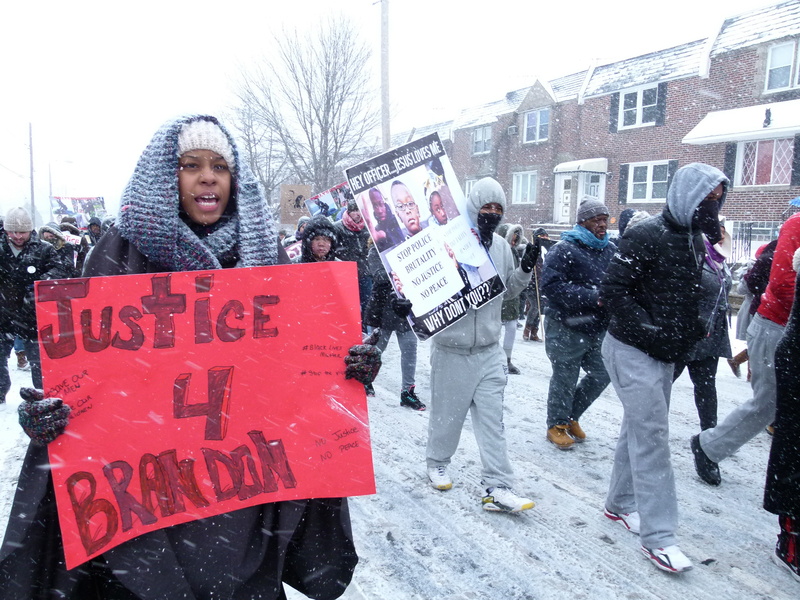 As new allegations involving the officer-involved shooting of Brandon Tate-Brown surfaced Saturday morning, supporters of the late 26 year-old and his family rallied in frigid temperatures and heavily-falling snow in the Mayfair section of Philadelphia to demand greater transparency and accountability from Commissioner Charles Ramsey and the Philadelphia Police Department about Brown’s death. 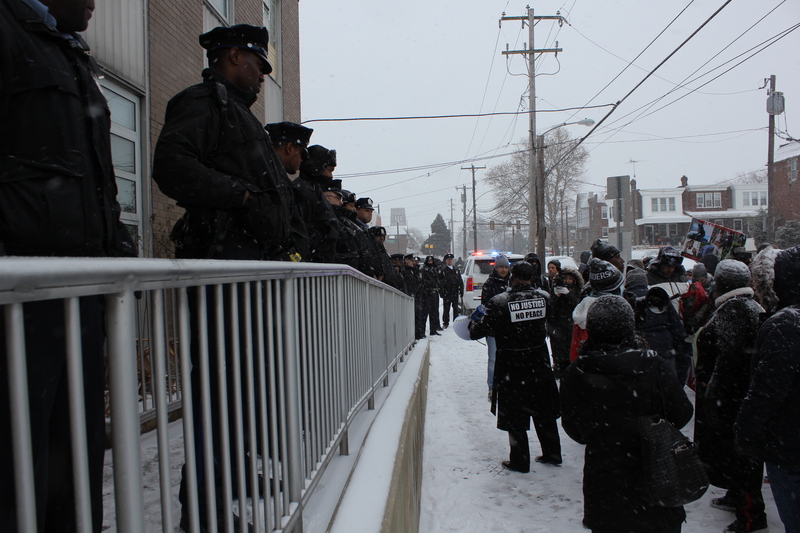 Family and supporters gathered on the 6600 block of Frankford Avenue – at the site of Tate-Brown’s death – and then marched through Mayfair to the PPD 15th District headquarters where they lobbed often heated, impassioned language at the row of officers posted outside. A young woman, who preferred anonymity, accused Commissioner Ramsey and department officials of trying to “control the narrative of the incident,” adding that “we’re here to demand release of the tape” toward almost uniformly expressionless officers who looked on from the precinct. 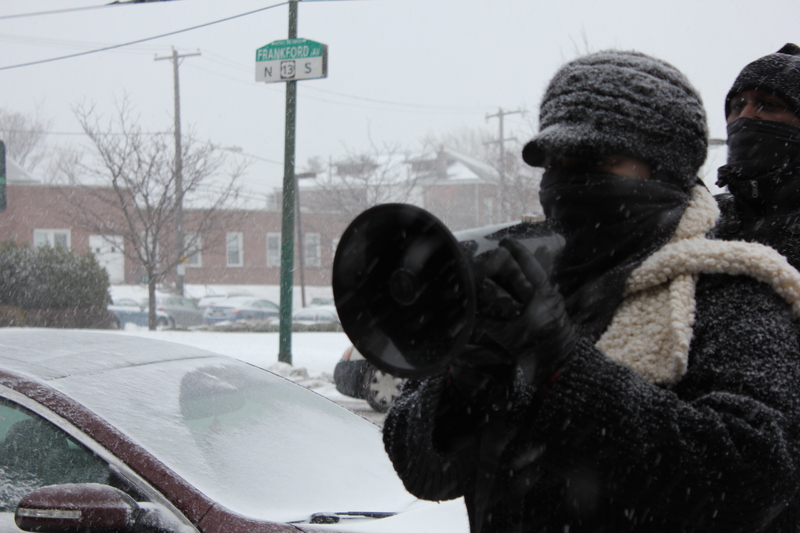 Demonstrators, including Tate-Brown’s mother, Tanya Dickerson-Brown, demand that footage of the young man’s shooting, and the names of the two officers – who have since been cleared of wrongdoing – be released to the public. Police Commissioner Charles H. Ramsey has said that his agency will not release the names, surveillance tape, nor any records of the investigation. The District Attorney’s Office is continuing its investigation. Ramsey was recently picked to head a White House commission tasked with reforming law enforcement practices amid growing negative public perceptions of police. Daily News reporter David Gambarcorta reported Saturday that Tate-Brown’s mother, after over a month of demanding to see surveillance footage of her 26 year-old son’s final moments with added pressure from the public, was allowed this week to see video of Tate-Brown’s December 15th encounter with police. According to Brown family attorney Brian Mildenberg, video which includes footage from a gun store camera in the vicinity of the encounter, among other locations, indicates that after fighting with officers in the course what police officials described as a routine traffic stop for driving with headlights turned off, and following their attempt to arrest him for what they allege was a stolen gun in the center console of his vehicle, Brandon Tate-Brown was shot in the back of the head after a struggle and then attempt to flee. The attorney also claims that the video shows Tate-Brown’s headlights were on when the traffic stop took place. Greg Brinkley, a private investigator hired by the Brown family, told Declaration contributor Vincent Heck in January that a nearby convenience store camera also captured footage showing that the vehicle’s headlights were on shortly before Tate-Brown’s encounter with police. 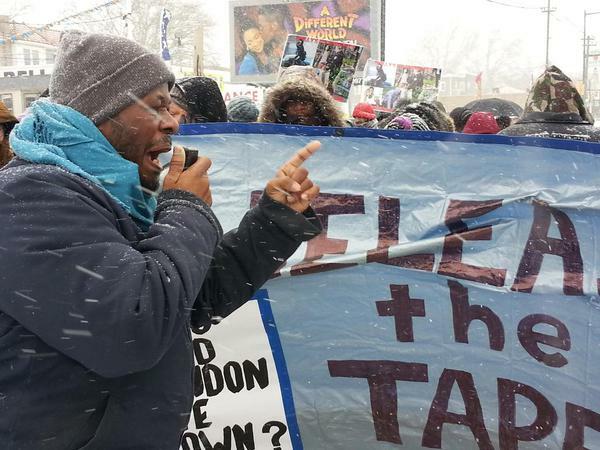 During Saturday’s demonstration, Brinkley alleged that the police are engaged in a cover-up over Tate-Brown’s death. The Declaration last week filed a Right-to-Know request for the Firearms Discharge Review Board’s report on the incident. Police have alleged that no officer misconduct took place in the early morning hours of December 15th, 2014, despite a then-ongoing investigation by Internal Affairs and homicide detectives. PPD spokesperson Lieutenant John Stanford told 900AM WURD (relevant portion starts at 11:57) in early February that Tate-Brown was pulled over by two officers – who have since been cleared of wrongdoing and returned to street duty – for the previously-mentioned traffic violation. During his interview, Stanford also claimed that after trying to “fight with those officers, uh, fighting with them to the point of not a struggle, but fighting,” Tate-Brown attempted to reach into the passenger side of his rental car to retrieve a gun to use on the two officers. Attorney Mildenberg and Tate-Brown’s mother, after viewing the video, contradict Lieutenant Stanford’s version of events. “He was behind his vehicle, near the trunk of the vehicle – not near any doors – when he was shot and dropped down,” Mildenberg told Daily News. The attorney also told the paper that Brown-Dickerson does not yet intend to file a wrongful death suit, but instead wants to determine the exact pretext for the traffic stop. Brown-Dickerson and counsel plan to pressure the Department of Justice to conduct a review of her son’s death. For the latest on this story, subscribe to us to receive email updates. You can also follow us on Twitter and Facebook.